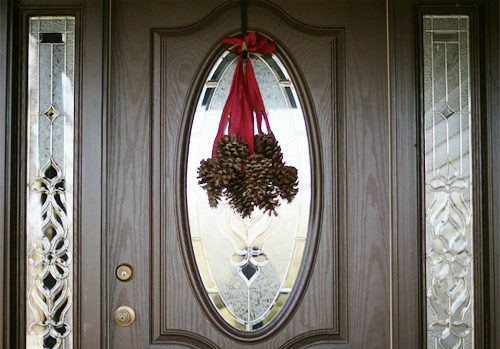 Aren’t these hanging pinecones amazing? I think they’re such a simple, elegant and inexpensive alternative to a wreath. If you’re able to gather pinecones rather than purchasing them, it costs even less! And it takes just a few minutes to make. My mom made this to hang on her front door, and I snapped a few pictures yesterday to share it with you. Wouldn’t they be cute with bells or silver balls like Myra’s pompom pinecones too? 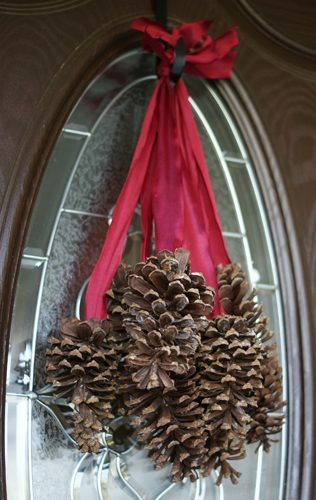 Attach the end of each ribbon to a pine cone with hot glue. Repeat for each pine cone. Gather the loose ends of the ribbons together and adjust them to stagger the pine cones. Tie a knot to secure the ribbons and then hang from a hook on the door. Hint: After we took this picture, we decided to loosen the knot and slip it over the end of the hook to hide it, and we really like the way that looks!